We are celebrating this Anniversary with a New Release. Our May 2018 release includes 6 new Clear Stamp Sets and 4 sets of Coordinating Dies, 4 new stand alone Creative Dies, 2 new Stencils and new Embellishments! This Blog Hop will be a TWO DAY Celebration - May 25-26, 2018 Don't miss second post tomorrow at Studio Katia blog. Всем привет и добро пожаловать на блог-хоп Studio Katia. Мы празднуем вторую годовщину выходом новых штампиков, ноже, масок и, конечно, украшалок. Этот блог-хоп будет проходить два дня, так что не пропустите еще один пост завтра в блоге Studio Katia. Here is my project for today. I create a underwter birthday card using some new products from Studio Katia. А вот и моя праздничная открытка. Я сделала подводную сценку о праздновании Дня Рождения :) Использовав продукты из нового релиза. You have arrived from Emily Midgett and Emily Leiphart is your next stop. If you get lost you can find the full hop list below or visit Studio Katia Blog! BLOG HOP GIVEAWAY info: Studio Katia is giving away TWO $100 CAD gift certificates on each day of the Hop, winners will be chosen from the comments left on all blogs of the Hop! 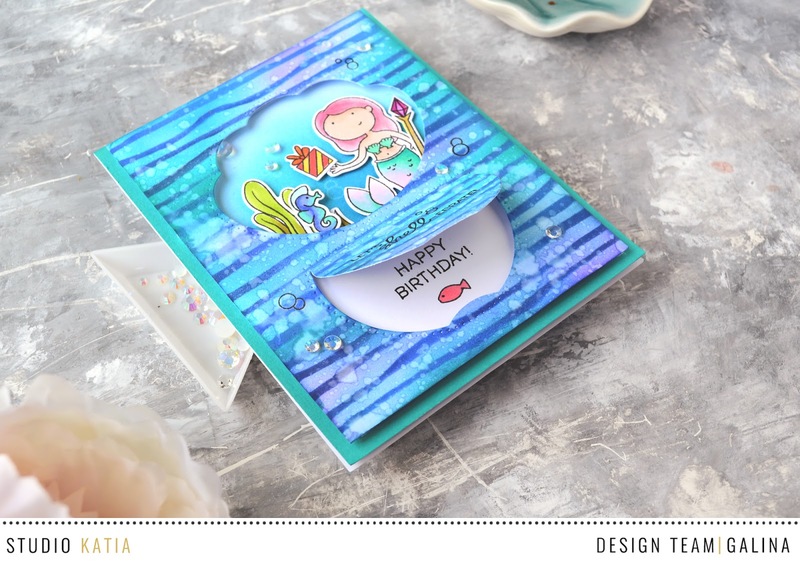 Such a sweet underwater card; the little mermaid is darling and how fun the 'peek-a-boo' window with the birthday message! Charming and delightful! Adorable card! I love your little hidden message! Thanks for the inspiration - your work is amazing! Such a mermazing card...Love it totally..
Love the interactive flap, great card! Great use of the little window. What a sweet card with a fun surprise - I love all kinds of interactiveness added to cards. Thanks so much for your inspiration! So cute and I love the lift the flap! Oh Galina, how sweet is this mermaid? I love the hidden sentiment, a great idea for this card. Really Cute! I love the opening at the bottom for the message! Thank you for the inspiration. Such an adorable card! Love it!! How adorable. Love the design of your card. Cute use of the shell die to make a window. What a lovely card ! I love your background !! GAlina!! I love your little Mermaid! I love your card. So cute with the pop up sentiment. So cute! Love the background and the flap. I like the surprise message window! Very clever of you! Thanks so much. Lovely card. I really love your design. Very sweet! Love that stencil! This is adorable. Love the shell frame cut out. Super cute card!! Love the mermaid!! What a fabulous card; I love it. Your card is so adorable. Thanks! Really cute card. Love it! The colors of your card are stunning. That background is fantastic! Love it! And love the little window and hidden message, such a fun card! So fun to see an interactive card. Love it. What a cute card! I love that background stencil already & your cute little peekaboo flap is an adorable idea! Great card! Delightful underwater scene you have created! Love the sweet mermaid and the awesome ripples for the water... cool effect! 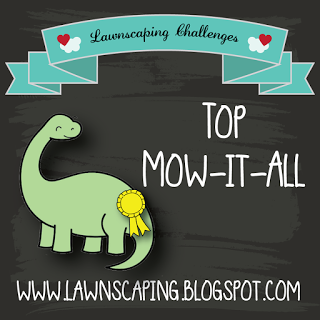 Great idea, love your card, so cute and funny! Happy 2nd anniversary Studio Katia! Love your card and how it had a hidden sentiment. Happy 2nd birthday Studio Katia. That flap is a really cool idea, especially when combined with this cute design. Love this card! Those blues! This is super cute. I like that you used the shel die cut. LOVE your card! It’s really pretty. Such a cute card! Love how you did the sentiment under the flap that looks kind of like a clam opening. Adorable! Your card is beautiful ! I love your idea of the hidden message. What a cute card! Love your colors you used! The hidden message is the best! An adorable card! Thank you for sharing. Love that hidden sentiment underneath the little flap!! It's so fun and creative and really adds a fun and whimsical touch to this beautiful card :) thank you for sharing! Fun and lively card. Love those blues and water drops. Perfect. Congrats on your 2 year anniversary. So very cute! I love the way the panel underneath opens up with a sentiment. Great design & wonderful colours! Galina, how cute is that mermaid scene? I love the hidden sentiment, a great idea for this card. SQUEAL!! LOVE LOVE LOVE your BEAUTIFUL Card!! SUCH AWESOME Design!! THANKS SO MUCH for sharing and hope you have a FABULOUS Memorial Day WEEKEND!! I love the clam shell! Such a cute and fun card. such a cute card, nice job with the back ground. Such a cute card! Love the flap window. Thank you for sharing. Great card! love the beautiful colors and surprise message! Cute design. I like the wave background. Love the bright, happy colors you used for your seascape. The brushstroke waves stencil is one of my favorite things in this release and you used it so srtfully. Love the surprise sentiment hidden under the "secret" flap. A wonderful card. Thank you for sharing with us. 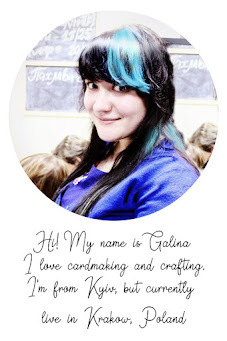 Adorable card, Galina! I love the shell die cut; it coordinates so well with the new sea themed stamps. Such beautiful ink blending on the wave stencil! Wow! Wow! Wow! I'm totally in love for your amazing card!!! Stunning background!!! This card is so pretty I love the new dies and adorable mermaids! Such a gorgeous card, love the hidden message using the shell die. The background is stunning and the way you coloured the mermaid is beautiful. What a super fun lift the flap card! LOVE the underwater scene you've created!!!! Your cards is so bright and fun. The flap is the prefect addition. Beautiful! Love your under the sea card! So brilliant Galina! I love how you used the dies together!!! I love the flap feature of this card! How fun! How cute! I really love the flap! Great idea! TFS! Your mermaid shellabrate card is wonderful! I love the way you did the coloring or inking for the waves. Really neat. Plus the peek-a-boo sentiment under the shaker portion of your card is marvy! Thank you for sharing!!! This set is so fun and playful and you have used it perfectly. I love this card, so cute, with the little surprise hidden under the flap.... adorable. What a fun card! Love the mermaid and the opening for the sentiment is so cute! Beautiful! I love all the layers and colors!! Fabulous card! I love the little hidden message - so cute! Such an simple but gorgeous card, thanks for sharing. Your background is so beautiful and I love how you used the shell die twice. The colours in your background are lovely, as is the surprise window on this card. Thanks for the inspiration.